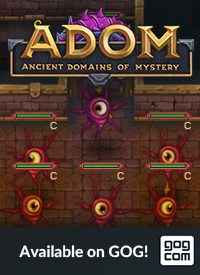 The Official Blog for ADOM (Ancient Domains Of Mystery): ADOM 2.3.5 released as Steam beta! 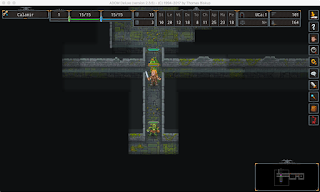 The general public release (which will be ADOM 2.3.6) hopefully will follow very soon - we just want to get feedback on stability, first impressions, etc. for a couple of days before it will be launched. Note that ADOM 2.3.5 still is a beta version - there might be bugs, crashes, etc. that we didn't discover in our tests. So be prepared for a little bumpiness - experience has taught us that general public releases are very different from prerelease test releases, which in turn yield a very different experience to our local tests. ADOM 2.3.5 is the culmination of more than a year of development (one year and one day today - our last release was ADOM 2.2.6 on October, 16th, 2016). We are still very sorry for the long break but it's mostly my fault as I severely broke my hand in December last year and it took a very long time to recover. ADOM 2.3.6 - which will bring tons of additional UI/UX enhancements as now finally have installed a real UI/UX lab and are doing supervised playtesting with new ADOM players (from all kinds of folks - ranging from people who never before have played a computer game to people who have logged thousands of hours into casual games, 3D games and/or indie games). The results so far are humbling - and extremely helpful. You can follow the progress in our special UI/UX milestone. 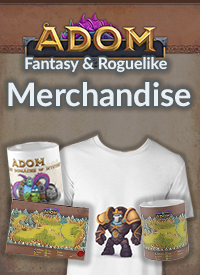 ADOM 2.4.0 - which will finish providing all remaining crowdfunding promises and is well on track. We hope to finish ADOM 2.4.0 by end of October. Both versions have have been - together with ADOM 2.3.5 - under parallel development and this is working very nicely for us. 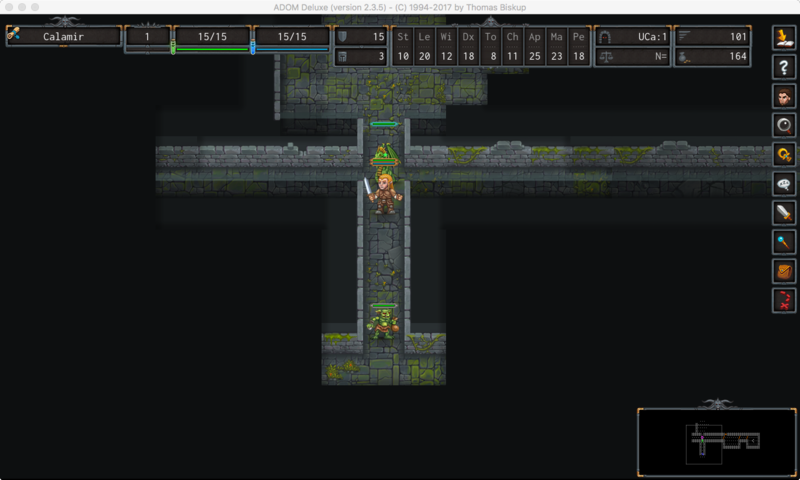 What can you expect in the Steam Beta of ADOM 2.3.5? We have completely redesigned the graphical HUD - it's much more beautiful, functional and elegant now. There has been lots of graphical fine-tuning. Especially noticeable will be that many monsters now are animated (and we are working on the remaining monsters and the PC as you read this). We have worked a lot on being able to play by mouse and general making better use of graphical assets. This should be a lot more convenient now. Additions include much better context-sensitive menus, smart tooltips (which no longer require you to enter look mode in the graphical game), smarter click interactions, variable mouse cursors indicating the next left-click-action, speech bubbles, a dialog system, a menu when pressing the ESC key, graphical quick hints to better introduce you to key commands, many tweaks to the UI (the inventory e.g. works much more conveniently now), many more screens now are graphical, etc. pp. A new "easy" game mode has been added that should make it much more fun for new players to get introduced to ADOM (and you won't be missing any content in easy mode - the game is just somewhat nicer to you). Point-based character generation now should be a lot of fun and offers many more options! The long-awaited Rolf quest and the volcano quest (crowdfunding promises) now are in the game. 117 new items and 22 new monsters have been added. New immunities, resistances, item abilities (e.g. levitation) and a whole new category of items (rechargeable items) have been added. Quests now have a much more elaborate and detailed status screen. The configuration settings now have a menu system that makes it much easier to configure many aspects of ADOM. You now can configure if you want to use talents as all, if they should be preselected by ADOM or if you want to manually select them. Additionally you can configure "your luck" during the game (e.g. cause ADOM to slightly fudge die rolls in your favor). Missile stacking/reloading has been greatly simplified. Additionally picking/dropping stuff has been completely revamped and now is much more powerful. 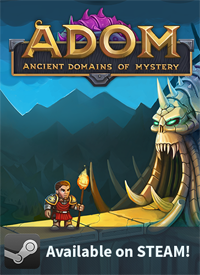 Now go to Steam and enjoy the latest release of ADOM :-) ! What about the prerelease testers? Jochen currently is building all the binaries for our prerelease testers, too. Sadly this is a much more involved process than deploying to Steam (especially as it takes a long while to upload all the binaries). Expect the prerelease binaries to be available at some point this afternoon (German time) - i n about 5-7 hours at most. You will then be able to download ADOM 2.3.5 as a prerelease test version from the usual location. The next major milestone for us is the release of a stable ADOM version in the very near future - which probably will coincide with a general public release for everyone (or be close nearby - we really need to do some more testing on the non-Deluxe version which we haven't started in over 12 months and will probably have some broken parts due to the vast amount of changes... but it should follow on the heels of the general Steam release). Thanks for continuing to improve on this already stellar game, I'm excited for the new quests. ALL ABOARD THE HYPE TRAIN!!! I'm so happy to see this update come to life! You guys had your struggles but didn't give up! Amazing, inspirational even! Now excuse me, I'll be playing ADOM for the next hours to come! Looks awesome. I hope something like this can be possible on Roblox, especially that you can get free robux. with the help of roblox helper. How does one go about purchasing Steam on Adom? :D That aside, this is a dream come true. I've been playing this game off and on for well over a decade now, and now I see some new content for this, like a personal favor. Maybe ADOM will move into the spotlight.